I found this footage on my computer. I hadn't uploaded it previously, but when I came across it today it made me smile, remembering back to how excited we were to get 7 eggs in one day. Now, we collect between 15 and 20 eggs each day from our flock as it stands now. 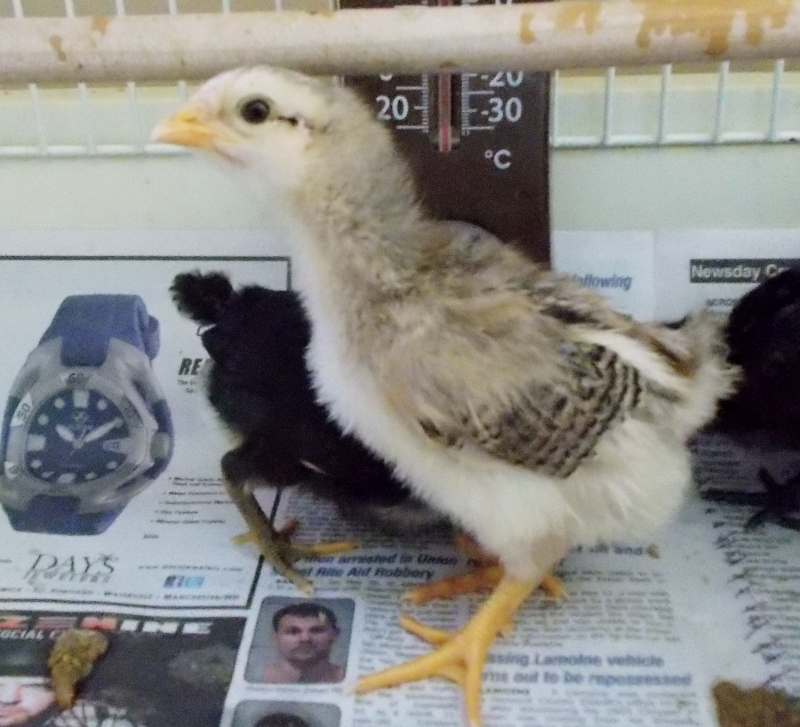 We hope that at least 8 of the new chicks we hatched and kept are hens. I have a strong suspicion that the chick in this photo is a rooster. There is no way to tell at this point, until they fledge out, grow, and eventually crow one morning, but 3 of the chicks do not panic and run away as the others instinctively do when you reach your hand into their cage. Instead, they stand taller and turn to face you. All of them are inclined to try a peck at your fingers when you handle them (after all, they do slightly resemble good sized worms), but these same chicks seem both more of a mind to peck a hand and more intent on you feeling it. Again, this proves NOTHING, but it does make me go hmmmmmm. Angelus's wing has not fully healed by the change in diet. Nor, has his moulting cycle helped to align his wing, so the next step is to attempt to splint it into place with some medical tape. In my research I found a video on how to do this, so when Sean returns from work tonight, this is one more matter to be added to our "To Do" list. I am glad it does not seem to bother Angelus in terms of either movement or pain, but if we can help it to heal and be aligned properly, that would be best. Both Angelus and the female mallard's eye infections are getting better. We have been using Bacitracin antibiotic cream on it and flushing them with a saline solution. The warning label on the tube of Bacitracin does say not to use in eyes, but the list of ingredients and dose was exactly the same as the other, so we tried it. If it had seemed to sting or if there had been no improvement, we would have consulted our vet. I do not suggest or recommend this to any readers, but it seems to be working for us. The ducks vision has returned now and though the eyes are still a little cloudy, I expect full recovery for both by the end of the month. Triple Antibiotic Ophthalmic Ointment is what is generally used to fight an eye infection, but it was going to take longer than a week to get here from ordering online and our local pet stores/ livestock stores were out of stock. It is a combination of three antibiotics: Neomycin, Polymyxin B, and Bacitracin. It is used to treat bacterial infections of the eyes and eyelids. The ducks and goslings must be moved to a new home outside SOON if only for the sake of my tender olfactory sense. I walked into our home today to all the windows closed, and both chicks and duckling/gosling pens needing an immediate changing! I know I have posted about this before, but I CANNOT emphasize what this combination smells like. It was bad enough that I considered leaving home to find somewhere better smelling to visit until Sean came home from work to help me with it- like "The Bog of Eternal Stench." Instead, I pulled on my work gloves and tackled the mess. It only took moments to do and after opening all the windows to air any residual offensive odor, I felt much more inclined to continue living here. I love the little babies, but I am going to have to love them outside and hope they continue to love me in return. The sun is shining bright and no rain in the forecast for a while. Enjoy it while you can! That chick looks like (he?) is saying, "What, you want sum a me, I ain't skert." Glad your house smells better. Lola is still peeing in the fireplace. I did go get the extra strength odor eliminator, so that is what I have to when I stop playing on the internets! I hope it works. I found your blog from BackYardChickens and I'm so glad I did. I have just recently (against my will) acquired two ducks. One of them had angel wing and I didn't know that's what it is called until reading your post. Now I'm off to research!